You know you need to get good at this, but the problem is everything you’ve tried doesn’t work. 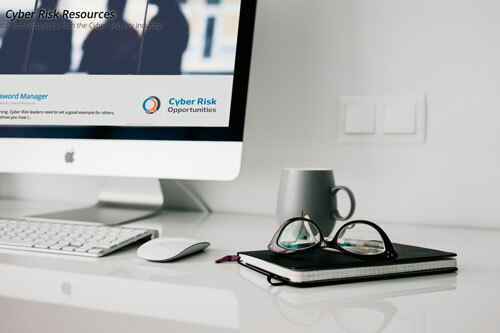 The Cyber Risk Opportunities Managed Program works because it approaches things from a business perspective. 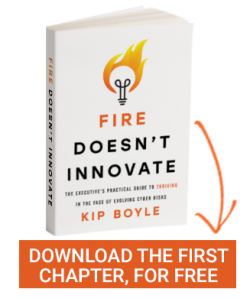 You need this; your organization needs this. Learn to answer these questions with confidence. Are you managing the right thing, or just reacting to the latest news story? We’ll help you prioritize your top five cyber risks in Phase 1 of the program. Our customers don’t waste time or money managing low-priority risks, no matter how important vendors or the media make them sound. Manage by facts not emotions. 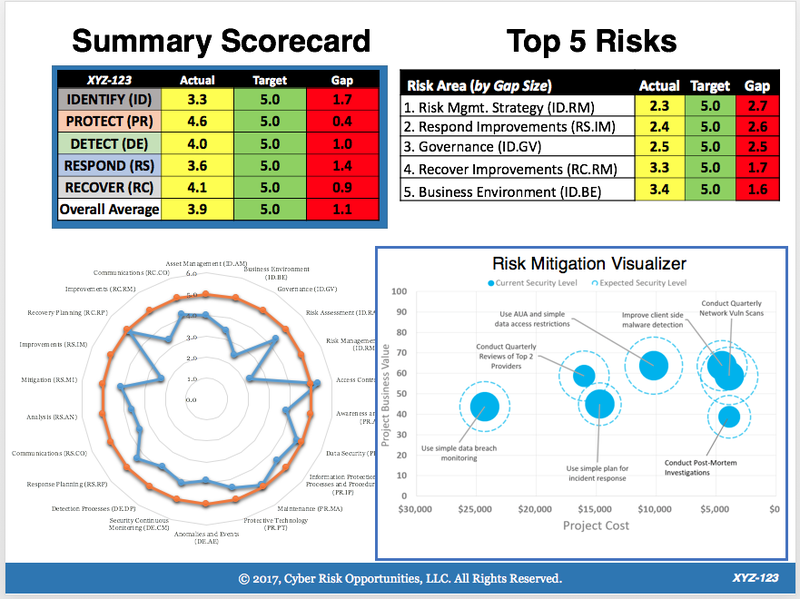 Are you getting the biggest bang for your cyber risk mitigation buck? We know you have a limited budget to manage unlimited cyber risks. You want to know you’re getting the maximum value for the dollars and time spent. In phase 2 of this program, we’ll develop a prioritized cyber risk mitigation plan for you. Are you (or your boss) tired of cybersecurity plans that go nowhere? We’ll help you prioritize your risks, so every dollar is spent wisely. With a prioritized list you can minimize failure to start and false starts. You can remove roadblocks and provide visual easy to understand results, produce meeting minutes, track action items, and celebrate successes. You’ll have a check-in with a cyber risk expert every month (or more often, if you like). Do the other decision makers know what you're talking about? Our trademarked Scorecard provides a graphic representation of your data in easy to understand terms. We’ll show you how to use this information for internal and external marketing to help people accept the changes necessary to reduce your top cyber risks. We’ll help you answer quickly and with confidence that you are practicing “reasonable cybersecurity” as defined by the FTC. Strong enough to withstand lawsuits with jury-ready evidence if need be. Never again be caught without a great answer to an increasingly asked question. Do the people at work know what they should be doing to help manage cyber risk? We believe that cybersecurity is a team sport, so that means you need to educate everyone, so they know the part they need to play. We’ll teach your employees to understand, implement and be proud of your cybersecurity initiative. The education we provide is so unique and effective, it gets noticed and remembered. Are you spending too much time and money dealing with cybersecurity compliance? You can decrease the overall amount of time spent on compliance to free up time for other high priorities. We’ll teach you how to tackle all data security compliance mandates at once to save time and money. Most organizations cybersecurity policies are out of date or not written down at all. How are yours? Feel confident that your documentation is useful, meets requirements, and always up-to-date. We do the work with a focus on meeting legal and operational requirements. Do you wish you had a seasoned chief information security officer who knew your business? Our customers feel confident that our approach, while different from other choices, is based on years of real-world security executive experience. Customers get guidance from someone who has successfully done the CISO job in highly demanding environments while still delivering solutions with real business value. Did your last ``free cybersecurity assessment`` come with a hidden agenda? Ready to start capitalizing on your cyber risk opportunity? Combating cybercrime is a necessity of doing business in the 21st century. Financial and identity thefts occur with annoying frequency, and no executive today can afford to ignore the damage phishing, malware, and malicious code pose to their company’s future. But, with this invaluable guide, anyone, no matter what their skill level or bandwidth, can become an effective cyber risk manager. Recognize, prioritize, and manage cyber risk and online threats. Adopt a 3-Phase approach that will help safeguard your business from cyberattacks. Cybersecurity is not just a technology problem, it’s a management opportunity. Learn how to manage cyber risks and ensure your company is cyber resilient now, and remain in the game no matter what the future holds.